In a heavy skillet, heat one inch of oil to just below the smoking point. 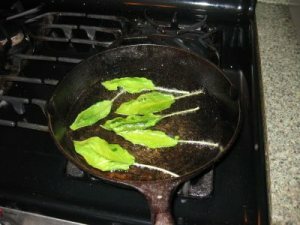 Place a single layer of leaves into the hot oil, and fry until crisp, usually 30 seconds or less. Properly fried, the leaves will turn hunter-green, not brown. Remove leaves from the oil with a slotted spoon or spatula, and set them on a double layer of paper towels to drain. Sprinkle with salt and, if you wish, freshly-ground pepper. Serve at once. Fried sage leaves are not at all pungent, just pleasantly savory. You might enjoy them, as I recently did, along with brie, smoked Gruyere, and a 2006 Chilean merlot. I hope you will take my sage advice, and try these no-cal appetizers. As always, you can post your cheers or jeers in the comments section below. Want more tips and tricks? Sign up for my weekly newsletter! I've had fried sage leaves before. They are like super-thin crackers. I can't wait to try this. Would olive oil be OK instead of canola? Katreader – I did not use olive oil, for fear it would burn too quickly. If you try it, let me know how it works out! I will have to try these. They sound wonderful, and I do have large clump of sage out back that's in desperate need of clipping! 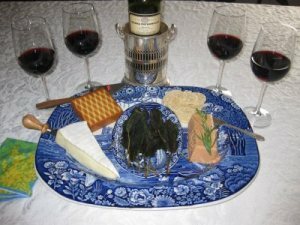 Kevin, thanks for the tip on the “proper” wine to serve with sage leaves. Details are always important!!! I tried it and they were delicious! I did try using olive oil and it worked beautifully, however, I used a very small pan and cooked very few (since it was just for me). I put the leaves in when the oil was just right and didn't let it get too hot. I understand about it burning to quickly, but for a small batch, if all you have on hand is olive oil, you can do it! May I use this recipe in my blog, of course, giving you credit and linking to you as well? 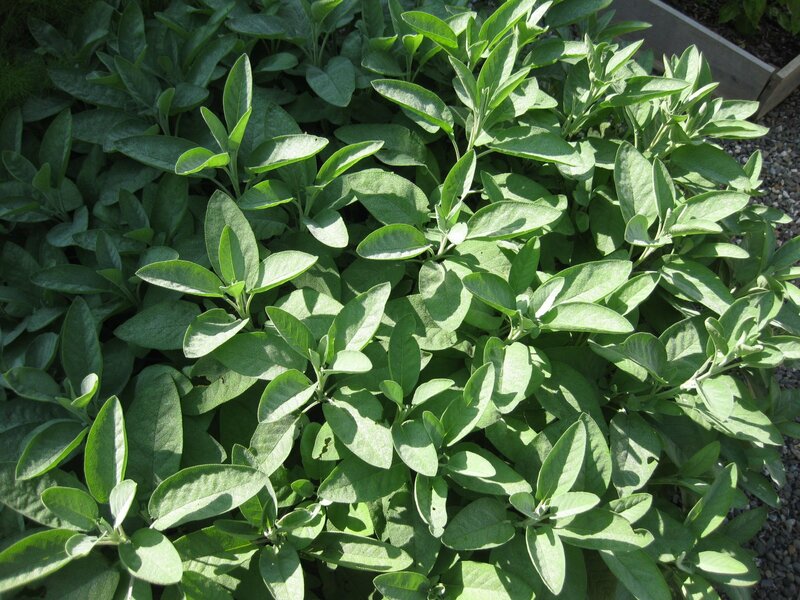 Katreader – I'm so glad you tried this sage-y treat and provided us with your olive-oil tip. By all means, share the recipe with your readers! Kevin, I made the leaves last night, and they are wonderful!!! I burnt the first five or so, but then lowered the heat. They seemed to be ready after only 10 seconds or so. I did not salt nor pepper them — they were good as is. Like Katreader, I ate them all myself, and without a shred of guilt. 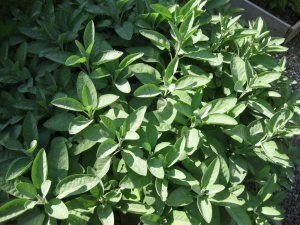 Now I wish I had more sage in the garden! I love this blog! What kind of plate is that? Welcome, Towel Warmers! The plate is Enoch Woods, Woods & Sons. I have a small collection of the “castle” series. They are quite old. Kevin, I tried them! SO EASY. They are too thin for dipping, but who cares? The leaves are so flavorful they don't require a sauce of any kind. Kevin, sounds fantastic. I will definitely try these fried leaves. So here's how I satisified my fried sage urge. Can of s&w small white beans in light sauce, I take out about 1/2 the sauce. You can rinse if you like, add chicken broth. Ran out garden and picked sage leaves, parsley and baby spinach. Put beans in microwave bowl add spinach. Zap for 2 1-2 min. Take out let sit covered while frying sage leaves.stir in chopped parsley Parm. cheese, hot pepper flakes, pepper, squeeze lemon. top with the fab sage leaves. bread and butter…….heaven quick! that was 1 to 2 min. Jamie Kunz – welcome to A Garden for the House. Your fried-sage-variation sounds DELISH. I will have to try it! Thanks! Thanks, love your site. I used a mostly canola with a glub of olive to fry leaves, gosh those are sooooooo good! also you could use a splash of vinegar if no fresh lemon, something to brighten flavor……..
Jamie – Thanks. Gotta love these 2 minute recipes! By the way — be sure to sign up for my weekly newsletter, if you haven't ready! Kevin, I have tried these (I mean, fried these!) several times now, with great success. In place of/addition to salt and pepper, I have also used just a touch of homemade seasoned salt (one with meyer lemon and rosemary, one with sundried tomato and smoked paprika, one with blood orange, meyer lemon and ginger). Great! Vicki – Thanks for this great seasoning-tip!